Enseal™ Vs. 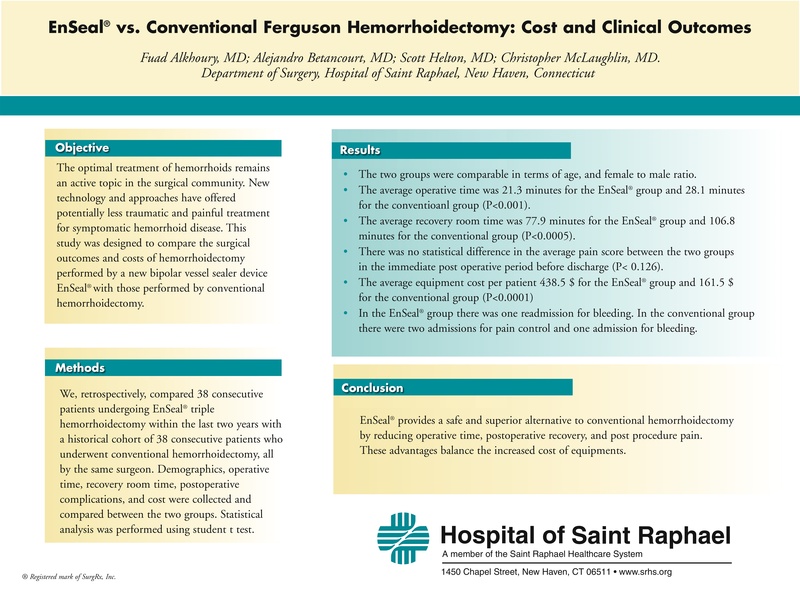 Conventional Ferguson Hemorrhoidectomy: Cost and Clinical Outcomes. The optimal treatment of hemorrhoids remains an active topic in the surgical community. New technology and approaches have offered potentially less traumatic and painful treatment for symptomatic hemorrhoid disease. This study was designed to compare the surgical outcomes and costs of hemorrhoidectomy performed by a new bipolar vessel sealer device EnSeal™ with those performed by conventional hemorrhoidectomy. We, retrospectively, compared 38 consecutive patients undergoing EnSeal™ triple hemorrhoidectomy within the last two years with a historical cohort of 38 consecutive patients who underwent conventional hemorrhoidectomy, all by the same surgeon. Demographics, operative time, recovery room time, postoperative complications, and cost were collected and compared between the two groups. Statistical analysis was performed using student t test.